Peanut butter, peanut butter cookies, and chocolate. Sounds like a good idea to me. And dangerously fast and easy to make. 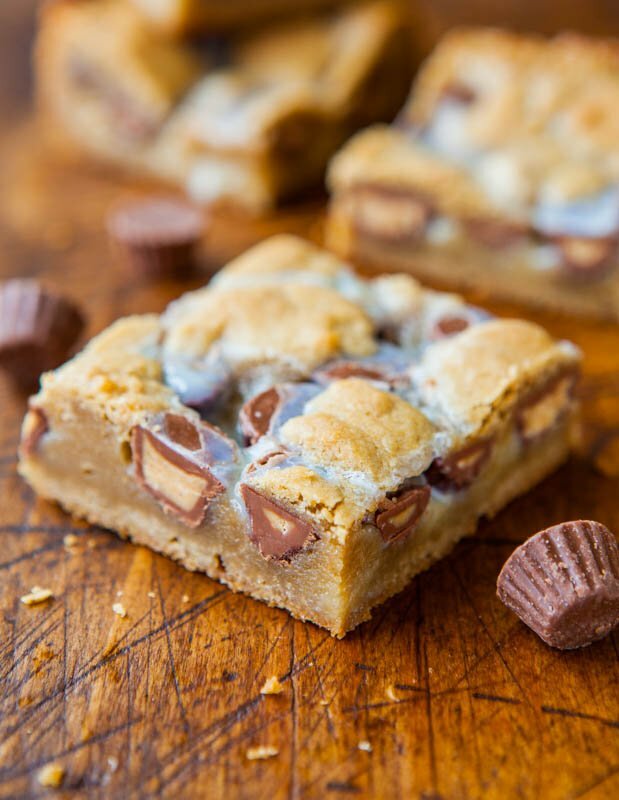 These rich, soft and chewy, peanut buttery bars are a hybrid of the Triple Peanut Butter Monster Cookie Bars and the Loaded M&M Oreo Cookie Bars, with Nutter Butter Cookies instead of Oreos. Even after writing a cookbook with 100+ peanut butter recipes, I can never have too much peanut butter. What better way to work it in than via Nutter Butters. If you’ve never had them, they’re peanut butter-sandwich cookies with a peanut butter filling. If you don’t have Nutter Butter’s in your area, try a storebrand peanut butter-sandwich cookie or vanilla-sandwich cookies like Golden Oreos. You’ll miss out on some of the peanut butter flavor, but it’s better to substitute than miss out on the recipe. 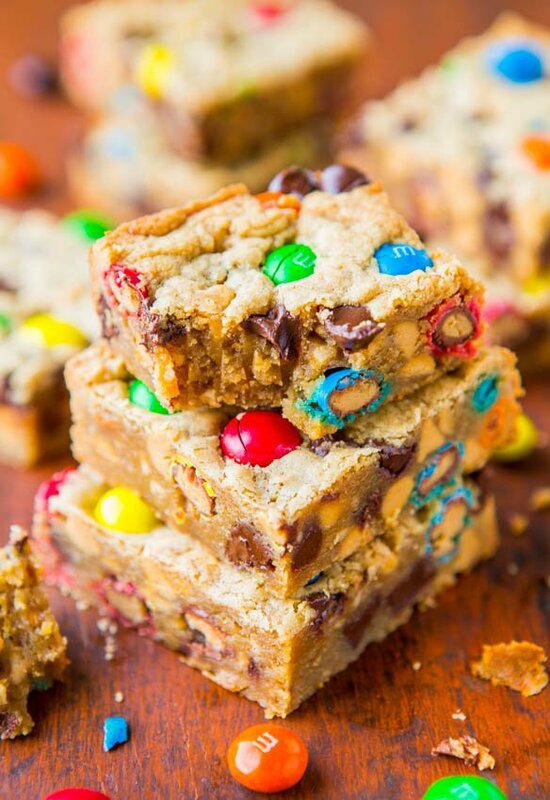 The recipe follows the pattern of my trusty blondies recipes, and are made in one-bowl, no mixer required, and the batter is whisked together in minutes before being turned out into a pan and baked. Simply melt one stick of butter in a bowl in the micro, stir in an egg, brown sugar, peanut butter, and flour, before folding in diced Nutter Butters and chocolate chips. I reserved a couple tablespoons each of diced cookies and chocolate chips and sprinkled them on top before baking so that I could really see those big, chunky cookie hunks and melty chocolate in each bite. We eat with our eyes first, and my eyes like to see cookies and chocolate. The bars have a nice peanut butter flavor, but it’s not overpowering, and the buttery, rich dough shines. Chocolate and peanut butter go hand in hand, and the semi-sweet chocolate is perfect against the sweetness of the Nutter Butters. The chunks of cookies are a wonderful contrast to the otherwise smooth, dense dough. Although the Nutter Butters soften slightly while baking, they provide a serious dose of texture. It’s a small batch recipe, making about 9 bars in an 8-inch pan. It’s a good thing I made these last week before I picked up my daughter at school. I ate one, gave one each to my husband and daughter, and promptly donated the rest of the pan to my daughter’s teachers. It’s way too easy to go to town on peanut butter and chocolate. 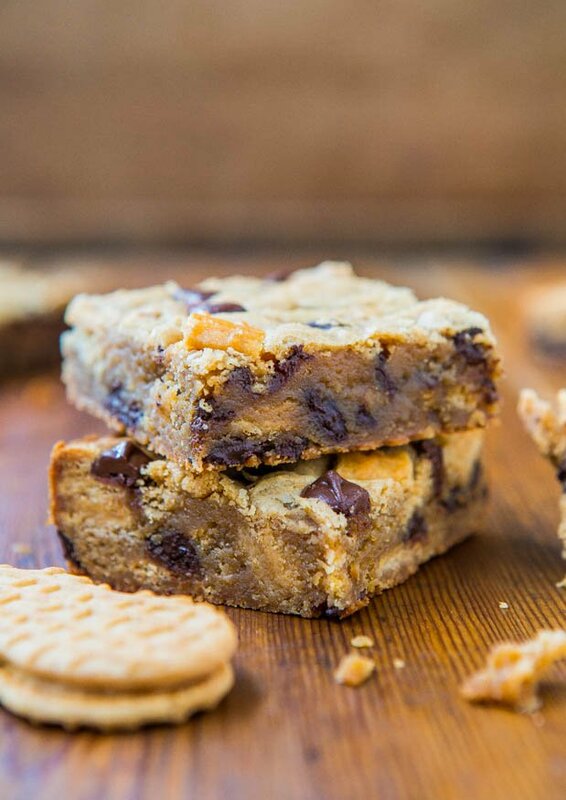 Especially vis soft, dense, moist cookie bars, packed with peanut butter and chocolate. About midnight when my inner snacking monster comes out, it’s really good these weren’t around. 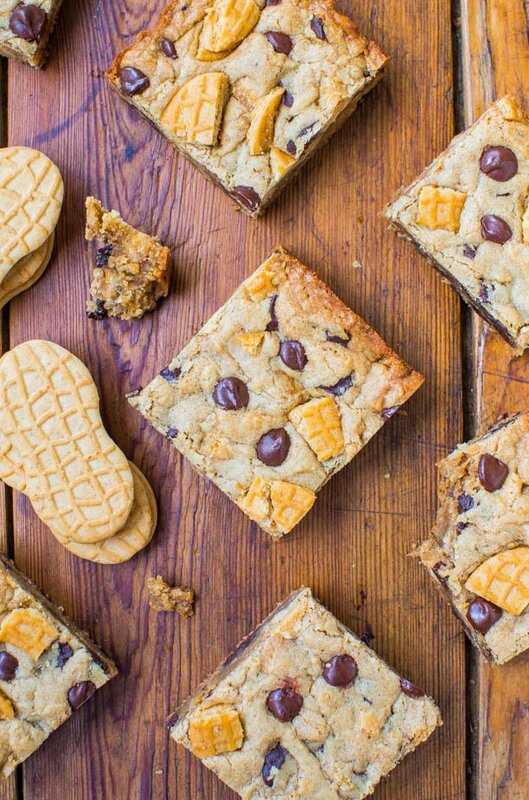 Peanut butter, peanut butter cookies, and chocolate is always a win. The bars are dangerously fast and easy to make, come together in one bowl, no mixer required. They’ve got a nice peanut butter flavor, but it’s not overpowering, and the buttery, rich dough is allowed to shine. The semi-sweet chocolate balances the sweetness of the Nutter Butters, and chocolate and peanut butter are made for each other. 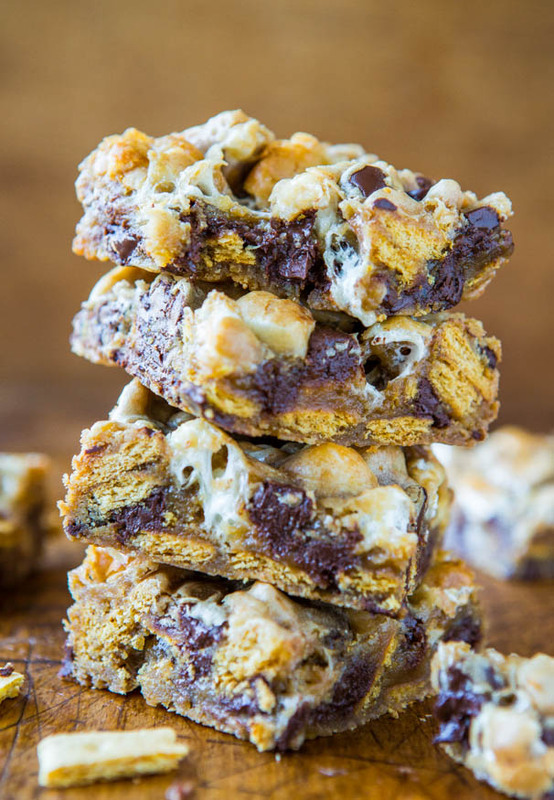 The cookie chunks are a wonderful contrast to the otherwise smooth, dense dough, and give the bars a serious dose of texture. If you can’t find Nutter Butters, substitute with another peanut butter or vanilla-sandwich cookie, like Golden Oreos. Add the peanut butter and stir until smooth. Stir in most of the chopped Nutter Butters, reserving about 1/4 cup to be sprinkled on top. Stir in most of the chocolate chips, reserving about 2 tablespoons to be sprinkled on top. 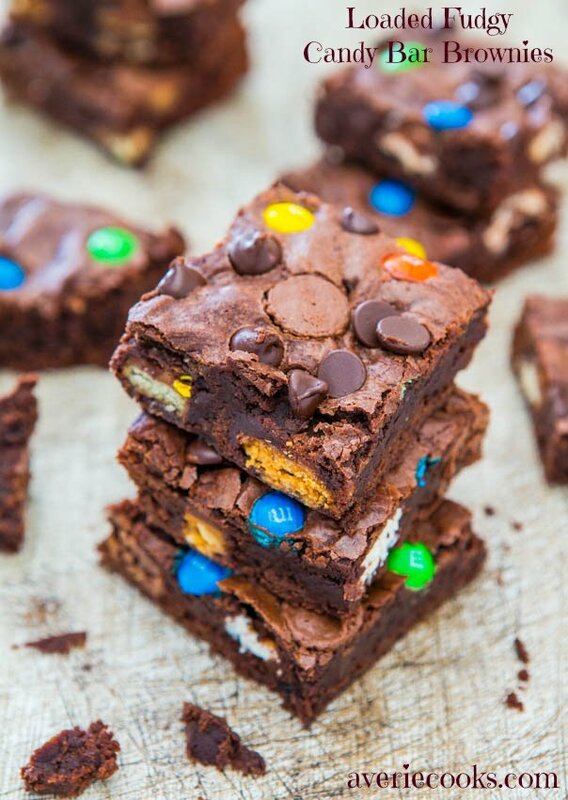 Evenly sprinkle the reserved Nutter Butters and reserved chocolate chips over the top, lightly pressing them down with your finger or a spatula. Bake for about 28 to 30 minutes, or until a toothpick inserted in the center (if you can find a bare patch to test) comes out mostly clean, or with a few moist crumbs, but no batter. Allow bars to cool in pan for at least 30 minutes before slicing and serving. Bars will keep airtight at room temperature for up to 1 week, or in the freezer for up to 6 months. Do you like Nutter Butters? 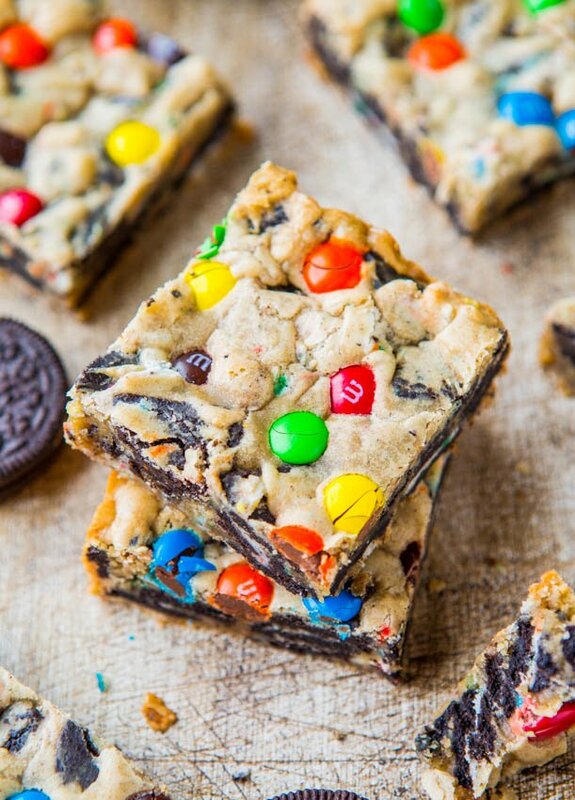 Mmmmm I totally have the urge to bake right now and these bars look AMAZING! A cookie…within a cookie? You have got to be kidding me. I could cry. Dangerously simple to made indeed! Oh, gosh. I love it when people put things like cookies inside of cookies. :) Plus, peanut butter! I’ve made your basic blondie/bar cookie recipe and it is so. good. It’s the perfect density! 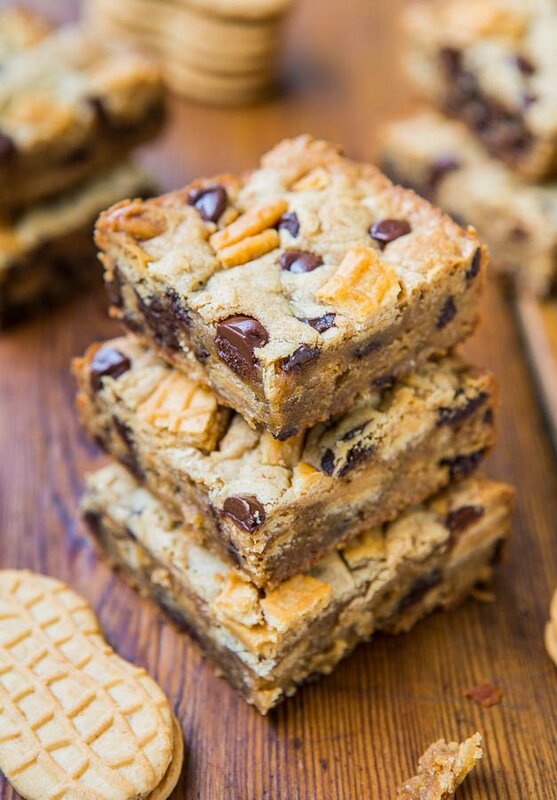 I don’t make blondies or bar cookies that often, but I will definitely go to your recipe when I do! Gosh, I wish I lived in your kitchen! Those look incredible! 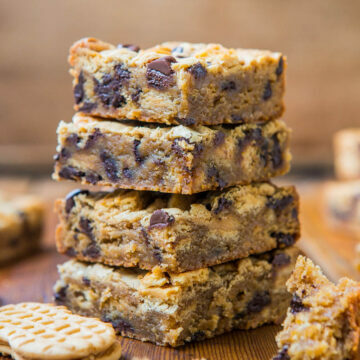 I always get so excited when I see your signature blondies and bars come up on my feed–such a chewy looking bunch with all the right touches–like Nutter Butter! If I buy myself a bag (and I haven’t done that in probably 10 years, eeks), I will so be making these. Thanks for sharing, Averie! Glad you like my bars! Hubba freakin’ hubba, man! Nutter Butters never survive longer than a night around my place. I either hoard them and inhale them, or my family spots the classic red bag and annihilates it instantly. However, I think I’ll manage to save a few to make these chewy, dreamy bars — those studded pieces of cookie look SO enticing! Thanks girl and your IG comment earlier today about Padma. She is absolutely even more stunning in person. She could be a supermodel rather than a food critic. Kid you not – stunning. Beyond words. I have an Aruba question and I was wondering if you could help. A group of friends and I are looking to rent a 4 bedroom house for a week in February. Do you have any websites that you recommend? We are hoping to get something not so fancy but a little more reasonable. I just want to look in the right place. I will be honest, Aruba is not ‘reasonable’ per se. Mexico and Jamaica are reasonable, Aruba, meh not so much. Now I’m sure you can shop around and get a good deal if you do your legwork but I really am not comfortable recommending something for someone else that I don’t know – your style, budget, dates, etc. I would never want that ‘pressure’ you know – to make a big vacation recommendation for someone! Hopefully you find something that suits you perfectly! ohmygoodness ohmygoodness ohmygoodness!!!!!!!!!!!!!!!! I MUST EAT THESE NOW!!! I have been a follower for some time, and I just ordered and received your cookbook and I must say, THANK YOU for writing such a wonderful amazing stupendous book!!! Thank you for the pictures on every page, for the recipe descriptions, for EVERYTHING! it is amazing and I look forward to cooking my way through this book many many times. 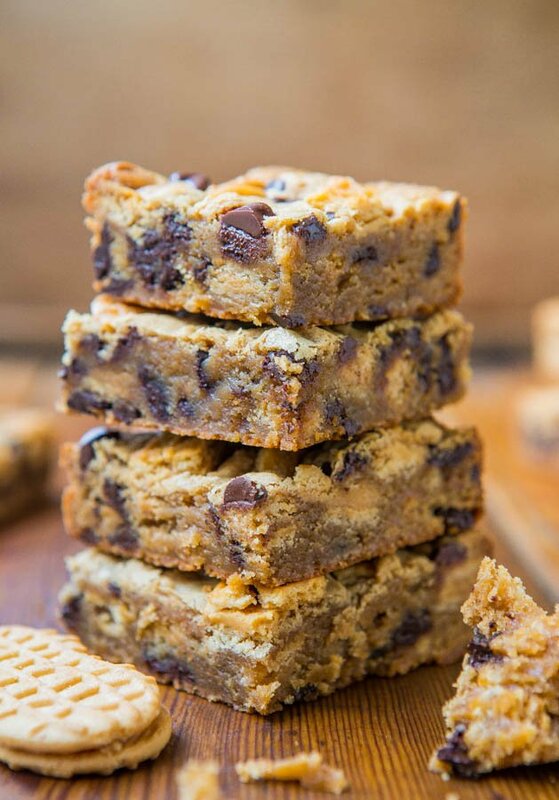 This recipe is so similar to the peanut butter chocolate chip blondies I posted a couple of days ago! Yours is even better though because you added cookies over top. Clever! Oh, I miss my blondies. Probably time for a new batch. I use this blondie base recipe as my gold standard and then doctor it up. I’ve got at least 15 recipes linked here in the post that start out similar and it’s the recipe base I used in my cookbooks! It never lets me down and is so easy. Glad you have your fave recipe too – so important to have that one ‘keeper’ in your arsenal! 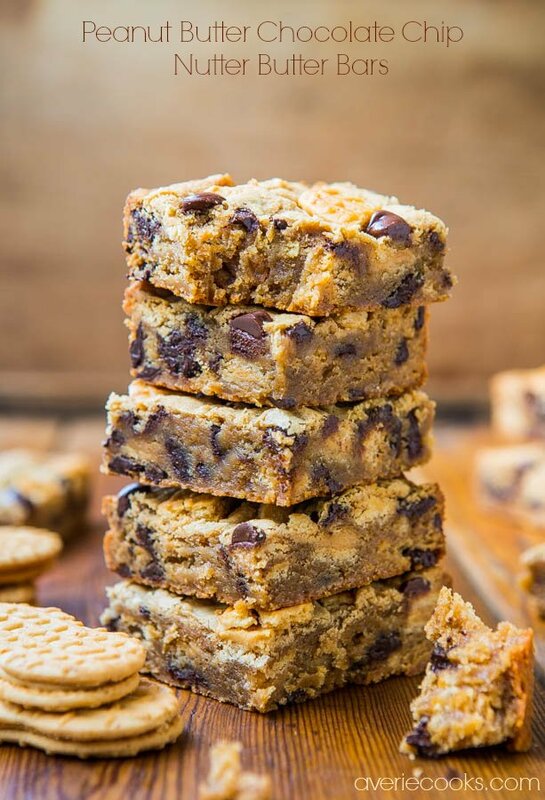 I loved nutter butters when I was a kid (and I still do) I cannot wait to make these bars!! 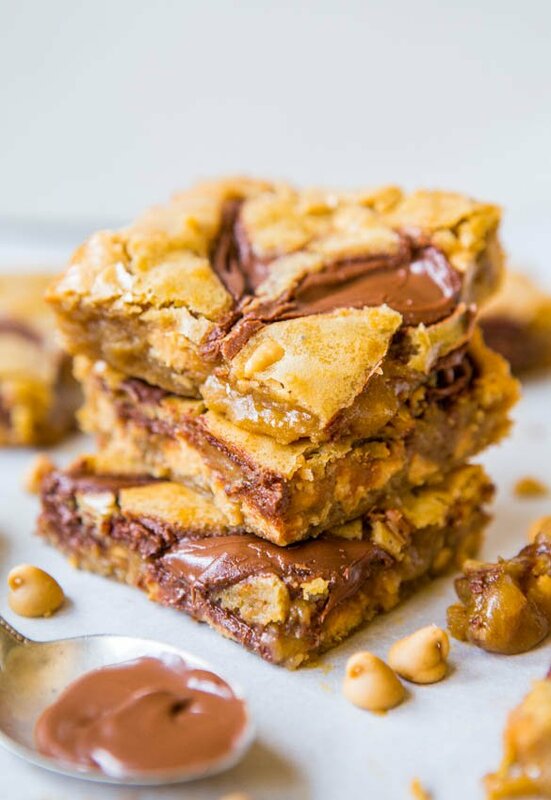 OMG Nutella , chocolate and peanut butter all in one. Yes, I can guarantee I would love these. 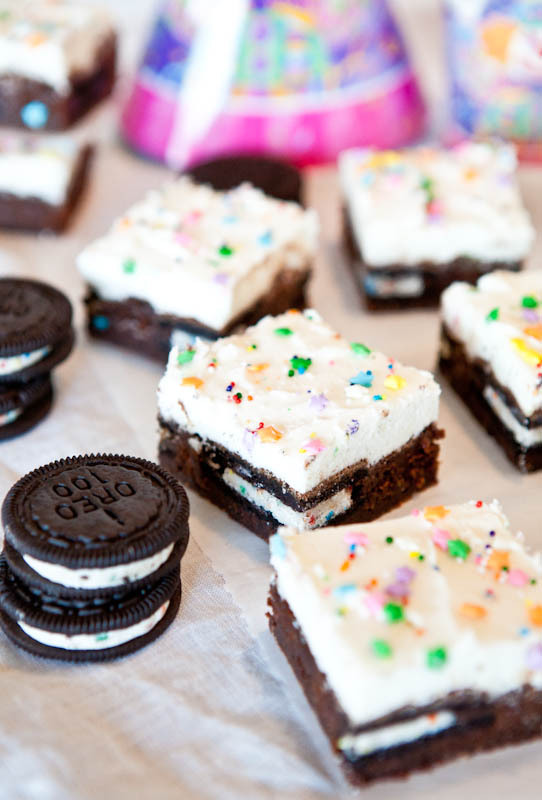 I plan to make these on Sunday so hubby can take into work. Question, Would I be able to double the recipe for a 9×13 pan and also, would I really need to bother lining with aluminum foil? I absolutely LOVE Nutter Butters!!! Lining your pan with foil take s10 seconds and really saves so much time with cleanup but if you prefer to just scrub you pan and not use foil, do what’s easiest for you. As for doubling and baking in 9×13, although I haven’t tried it, I’m sure it would work. LMK how it goes and how you like the bars! 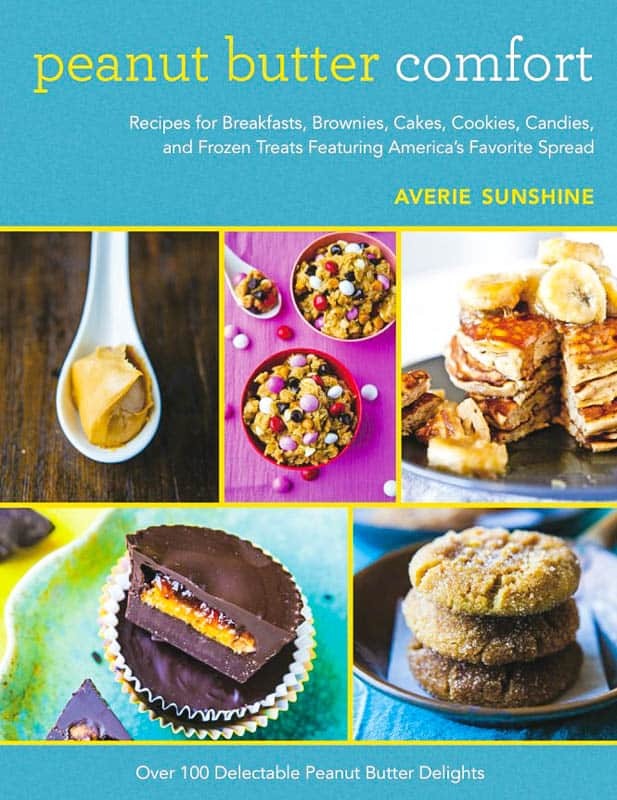 Hi Averie, your recipes rock! 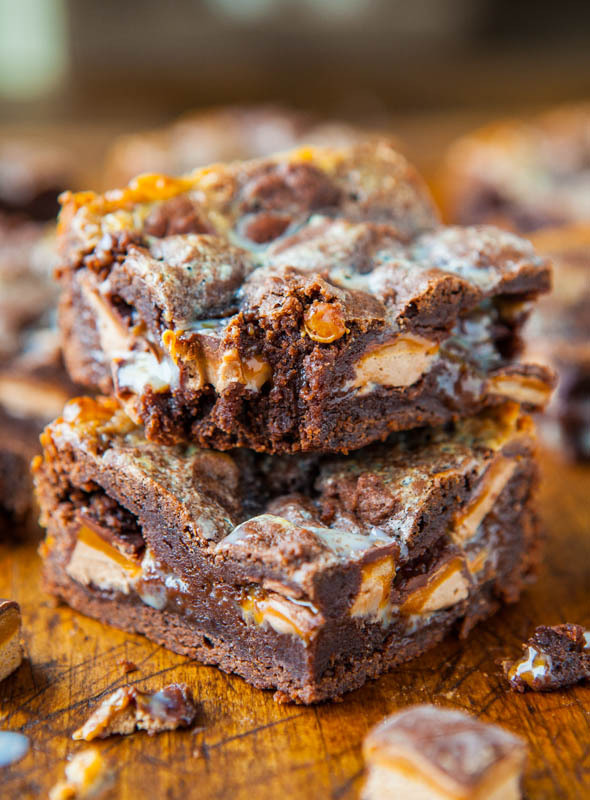 Im looking at your peanut butter nutter bars recipe. I need a little bit of asistance. 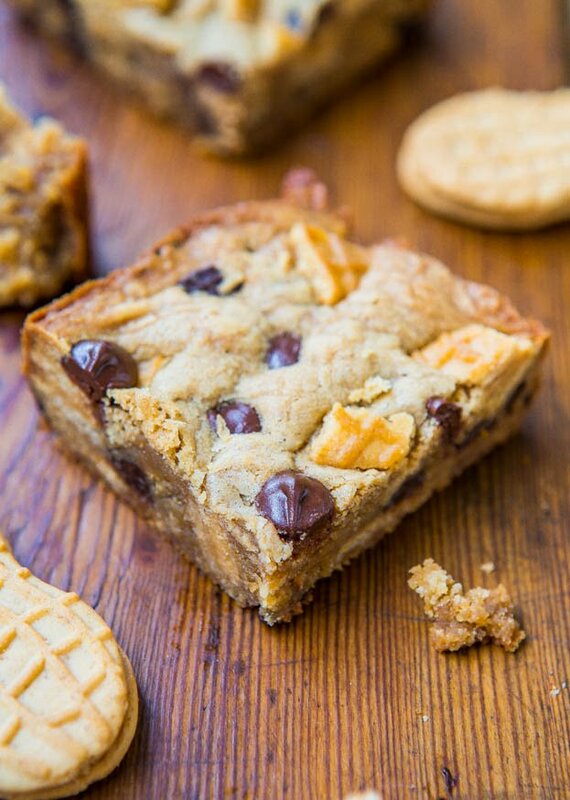 I want to mail my friend some peanut butter cookie bars. PB cookies are her favorite but I wana make them in bar form that will mail well as its the first week of January. 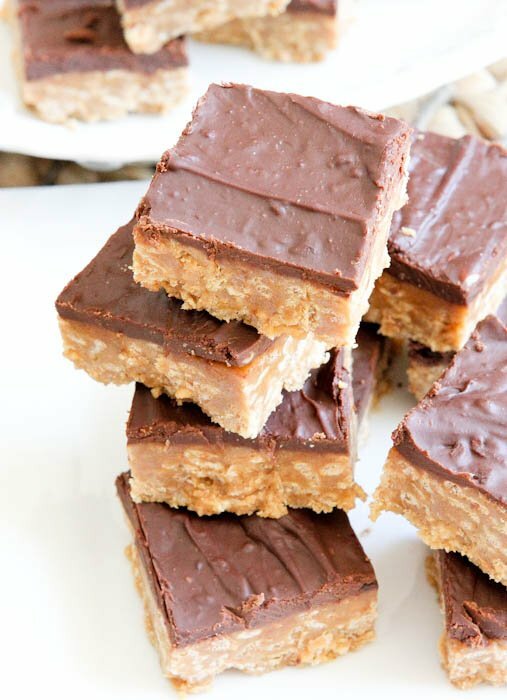 Can you please recommend a very yummy peanut butter bar recipe of yours? Shes not an oreo cookie fan but likes everything else. How would you package the bars for mailing? Thank you ;). Hi Averie! 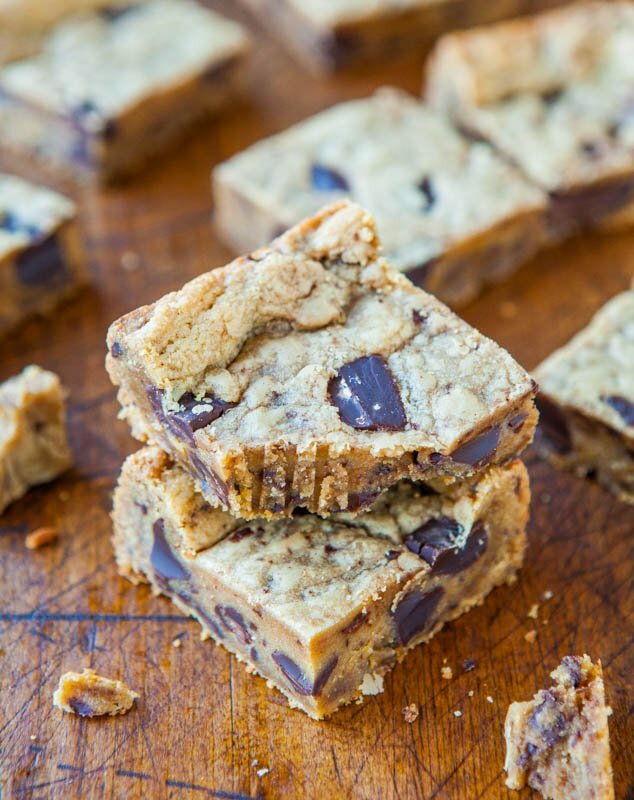 Nutter Butter bars sound soo good. Can I double the recipe for a 9 x 13 pan? Will the bake time be the same as is for the 8 x 8 pan? Thank you. Such yummy recipes! I’m sure you can double and bake in a 9×13. I wouldn’t mess with the baking time too much – keep an eye on things but I would say shoot for about the same duration as I did with the 8×8. I just did it, and my boyfriend and I absolutely LOVE it ! Have to admit everything was eaten really fast. I just put less sugar (90 grams) because we don’t like it when it too sugary, and i turned out perfect. Thank you for this super recipe ! Thanks for trying the recipe and I’m glad it worked out great for you!